Roofing Contractor Colorado Springs: What Makes Go2 Contracting One of the Best? 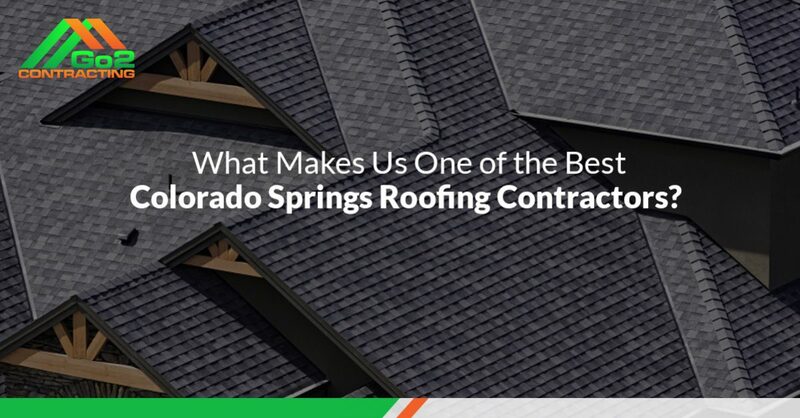 What Makes Us One of the Best Colorado Springs Roofing Contractors? When it comes time to replace the roof on your home, you want the peace of mind that comes from working with one of the best Colorado Springs roofing contractors around. No one understands this better than Go2 Contracting, which is why we strive to provide the most affordable and reputable roofing services in town. Our signature Tuff Roof System blows other roofing systems out of the water, as it either meets or exceeds local building codes to provide you with a long-lasting roofing solution to restore beauty and integrity to your home. Let’s take a closer look at six specific components of this durable system. This waterproof membrane underlayment is designed to prevent your roof from leaking due to wind-driven rain and ice dams. It is typically made from polymer-modified bitumen so that it creates an effective moisture barrier when installed under shingles. This is especially important in Colorado given the strong winds and heavy rain we experience, as well as the ice and snow that can linger on a roof for months in the winter. Many local building codes don’t require ice and water guard, but you can rest assured it will be installed with our Tuff Roof System. Throughout the roofing industry, it is standard practice to attach shingles to the roof decking with nails to ensure a secure roof installation. Many Colorado Springs roofing contractors use the minimum number of four nails per shingle as required by code in an effort to save time on the job and money on materials. However, this can result in a sub-standard roof installation with shingles that lift with the first strong wind. At Go2 Contracting, our roof replacements include six nails per shingle to ensure they stay securely fastened to your roof, even in high winds. The term “roof valley” refers to the point on a roof where two roof slopes meet. Depending on the pitch of the roof, roof valleys might be very shallow, or they may form a very sharp V shape. In either case, they are very vulnerable to developing leaks because of the amount of water that is funneled to them. Most local roofing codes require a minimum of 90-pound rolled roofing to be installed in the valleys to ward off leaks, but Go2 Contracting goes one step further. We install metal valleys to ensure you never have to worry about an interior water leak. Every beautiful, functional roofing system relies on a number of components to work in symphony to divert water away from the home and otherwise provide protection from the elements. Unfortunately, there are opportunities for leaks to arise anywhere the edges of each of these components meet. The industry standard is to seal seams and joints with tar, and that is all that building codes usually require. Our team has found that Rainbuster caulking outlasts and outperforms tar for these purposes, which is why we use it to provide superior leak protection. Applied directly to the roof decking, roofing felt is a material that is specifically designed to provide a layer of protection from extreme weather. It is usually made from various blends of polyester, natural plant fibers, asphalt, and bitumen, and it is applied as a base under all other roofing materials. Building codes generally only require 15-pound felt, but our team uses 30-pound ASTM-approved felt for a couple of reasons. One, it provides our roofers with more stable footing as they are working on your roof, keeping them safe. Second, it is more durable than 15-pound felt and is more likely to stay intact during a storm. This material is installed along the leading edge of your shingles where they meet the gutters in order to protect your roof decking from water damage. Local building codes don’t always require drip edge, and where it is required, some roofing contractors simply extend the shingles over the edge of the decking as a workaround. However, these shingles will eventually fail, and the results can be catastrophic for your home. Go2 Contracting installs 26-gauge metal drip edge to ensure water is properly diverted to your gutters, protecting your decking and siding from unnecessary water damage. Are you searching for experienced Colorado Springs roofing contractors to install a new roof on your home? If so, then look no further than the Tuff Roof System from Go2 Contracting. Our team will carefully install each component to ensure your roof stands the test of time. What’s more, we even offer our unique Go2 Contracting maintenance plan. This plan provides physical inspections of your roof to ensure all components are functioning as they should be, allowing you to protect your roofing investment and maximize the life of your roof. Other roofing companies in Colorado Springs can’t say the same about their roofing services. Contact Go2 Contracting today to request your free roof replacement estimate!